HARTFORD, Conn. - UConn and Vermont each scored first period goals, but neither team could get the puck across the goal line over the remainder of the game, and the match ended in a hard fought, 1-1 tie Saturday afternoon at the XL Center. After Vermont took an early 1-0 lead, scoring off a UConn turnover, the Huskies responded to tie the game late in the period with a goal from freshman Danika Pasqua that was set up by Tristyn Svetek and Rebecca Lindblad. The conference foes continued to get shots on net in the second and third periods, but couldn't quite capitalize. Vermont had a late chance to take the lead in the third, but a stellar defensive play by Taylor Wabick kept the Catamounts at bay. UConn put up several shots of its own in the final minute but unfortunately, Vermont denied the Huskies at the doorstep. Junior goaltender Morgan Fisher collected 21 saves in the tie. Vermont tallied the first goal of the game after capitalizing on a turnover. Alyssa Gorecki stole the puck and lit the lamp after beating Fisher in a one-on-one matchup to put the Catamounts ahead 1-0. UConn delivered its response with just over 30 seconds remaining in the period. Rebecca Lindblad chased down the puck and rifled a pass over to Tristyn Svetek who was positioned on the right side of the ice. The junior knifed her way through the Vermont defense and dropped off a pass in the crease to Danika Pasqua, and the freshman finished the play by tapping the puck into the cage to level the score at 1-1 at 19:31. Neither team was able to get a shot across the goal line in the second period. Each team pestered the opposing goalie by getting plenty of shots on net, with the Huskies holding a slim 7-6 margin in shots on goal. UConn got a power play in the period, its third of the day, but couldn't capitalize on the extra man advantage. The Husky offense was all over UVM goalie Blanka Skodova in the third period, peppering the UVM goaltender with seven shots but couldn't sneak one past the junior. Fisher was equally up to the task, turning away all the seven shots she saw from the Catamounts. Vermont had a chance to take the lead with just over three and a half minutes left, but a diving save effort from sophomore Taylor Wabick prevented the Catamounts from taking the lead. 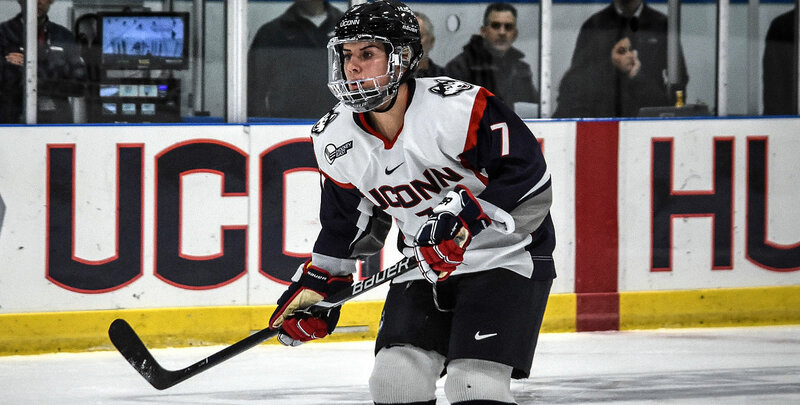 On the opposite end of the ice, UConn had multiple opportunities in the last minute to take the lead and the game, but Skodova snuffed each shot, sending the game into overtime tied 1-1. Both teams only managed to get one shot off in the overtime period, resulting in a draw.